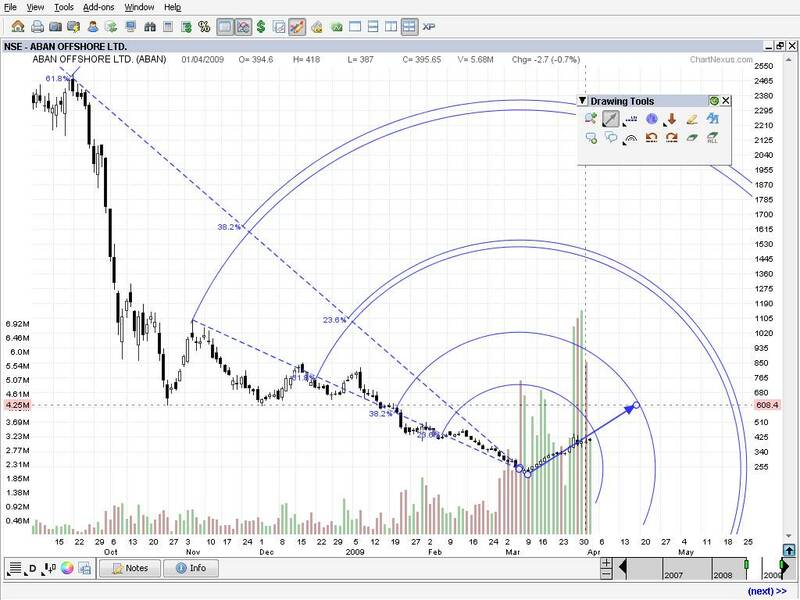 Fibonacci arcs are a charting technique based on Fibonacci numbers, used to predict the future support and resistance levels for a financial instrument. A typical Fibonacci arc consists of three curved lines; but traders can increase the number of lines with respect to Fibonacci numbers. Fibonacci arcs can be created for both short-term and long-term trends, and as well as for both bullish and bearish trends. The procedure for creating Fibonacci arcs is simple and most advanced trading systems allow traders to draw them. First a trend line is plotted for connecting to extreme points – usually connecting the highest high and lowest low of a given period. Then Fibonacci arcs are plotted as three curves which intersect the trend line at key Fibonacci ratios 38.2%, 50% and 61.8%. Traders can extend the number of curves if necessary by plotting them at 100%, 132.8%, etc. Usually when a trend cross a Fibonacci ratio curve (say 38.2%), the curve becomes support for uptrend and resistance for downtrend and the next Fibonacci ratio (50%) becomes resistance for uptrend and support for downtrend.